The speed, coverage and reliability of the 4G data network makes it a viable option for organisations looking to gain rapid connectivity for a location or to have a fall-back option to their existing fixed-wire connectivity. By negating the need for a physically wired connection not only does 4G take the leadtime for service delivery from weeks to hours, it can also overcome the challenges associated with wired connections to remote locations. 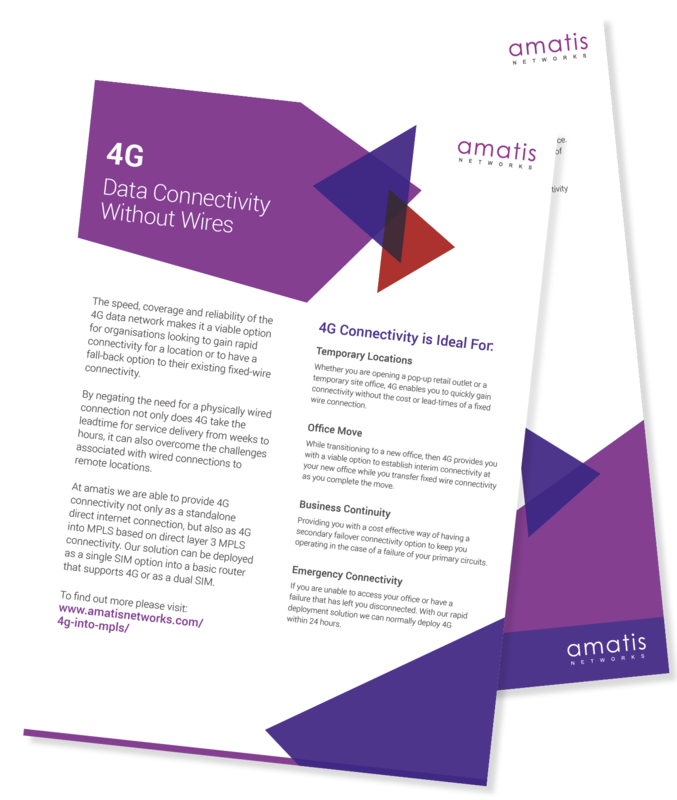 At amatis we are able to provide 4G connectivity not only as a standalone direct internet connection, but also as 4G into MPLS based on direct layer 3 MPLS connectivity. Our solution can be deployed as a single SIM option into a basic router that supports 4G. Download the 4G datasheet to find out more.